When you only have 5 to 10 minutes to prep a recipe, this one really does the trick! But you would never know, because it tastes so full and rich, creamy and thick, with the perfect balance of sweet and earthy flavours. This time of year we love warming, cozy soups. 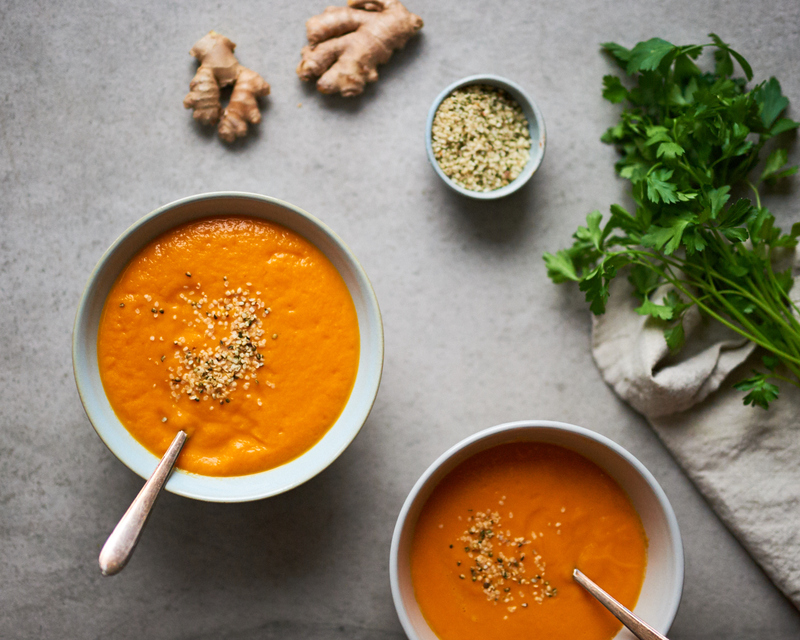 This Carrot Ginger soup is especially good if you are sick because the ginger, onions and garlic will support your immune system. You’ll find that this soup is easy to swallow but has lots of body to it, the complete opposite of a thin, watery soup. In fact, if you find that it’s too thick, you can add some extra broth to thin it out. 1. Heat a spoonful of olive oil in a pot and saute the onions, garlic and ginger root for around 5 minutes, until translucent. 2. Add the carrots, celery, veggie broth and sea salt and pepper to the pot. Bring to a boil and then reduce to a simmer. Cover and simmer for 25-30 minutes, until the carrots are soft. 3. Carefully pour the soup into a high speed blender and blend until the soup is smooth and creamy. 4. Taste and add more sea salt or pepper if needed.